If you're looking for this week's "Hit Me With Your Best Shot", click here. Mrs. 4444 is ready to help us declutter those fragmented thoughts we have running around in our head! She does this every Friday so we can start fresh for the weekend! Laika wasn't too thrilled with our walk Wed. morning. I had the leashes on her & Pepper and started out the door, but didn't notice that it had started to rain. So, I grabbed an umbrella and we trudged on. Laika kept looking back toward the house when we first started walking, but then she trotted beside me the whole way. No pulling or trying to chase anything that morning! Last year, I talked about a duck couple that I kept seeing at the duck pond. There's a mallard couple at the fountain in the park this summer. I've seen them every day; they're so sweet. It really seems like the male looks out for the female, ready to protect her. There's also a female & 2 male mallards (what's up with that?) on the other end of the park. I've seen them for a few days. One morning, they were in the creek where there's a high bank & where the dogs will go in to get a quick drink. I didn't notice the ducks were in there until Laika was in the creek and the ducks flew out! I don't know who was more surprised: Laika or the ducks! Y'all have GOT to see this! Ingenious! 9 pounds down...28 to go! Slowly but surely it's coming off. It's not as fast as it was 10 years ago, but I am 10 years older! My favorite app developer sent me another free app yesterday to review on my speech blog! This one is the first test to be standardized in an app format. I'm super excited to get a good look at it and write a review! On Wednesday, I had a couple of people let me know that my pictures (header, background, and pictures in posts) weren't showing up on my blog, but I checked it on Chrome, Firefox, and Explorer and didn't have any trouble. Now, the background isn't showing up on my speech blog. My next step is to change the background and see if that does it. That really stinks because I really like the background I was using. Have a wonderful weekend! See y'all back here on Monday! Great job on losing the weight. You can do it! Way to go on the weight coming off! Slow and steady ... and you'll get there! I saw that grape slicing technique on Facebook the other day ... someone said that it works for grape or cherry tomatoes, too. Look at you shedding the weight!!! Your background comes up SLOWLYYYYYYYY on my computer. Congrats on your weight loss!! Love the grape slicing. I definitely have to try that. Love your son's pictures. 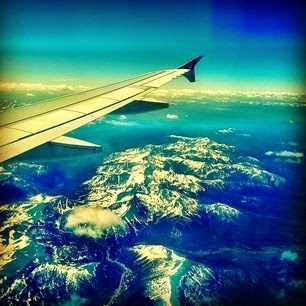 I love to see pics from a plane window. I've also been having problems with my blog. My dog loves walking in the rain. However, he is scared of swimming pools, the hose, and water in other contexts. WEIRD, huh? Good luck on the weight loss. I know I need to do it. Congrats on the 9 pounds! Maybe that female duck has the right idea -- haha! Congrats on the weight loss. 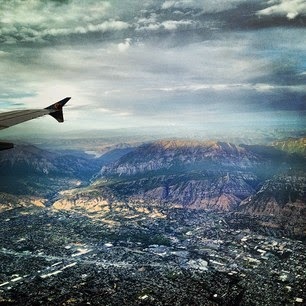 I love taking pictures from the plane, he took some great ones. I had the best time watching some ducks near my dad's house. Ducks are so cute. I remember when I used to feed them. Its been a good while since I've seen some. I think I've lost some. After this boot comes of I'll have to check.